Once the center of a smallish, quiet town just southeast of Bethlehem, the past few decades have seen younger generations gradually depart from Beit Sahour’s Old City for more modern living, more space, and better opportunities abroad not found in an economy stifled by 50 years of Israeli occupation. As a result, many old buildings, with their thick stone walls, vaulted interiors, and arched windows, have been neglected after passing down from family to family and enduring bouts of Israeli military presence that have also been inherent to the decades-long occupation. But in recent years, young artisans from across the occupied West Bank, attracted by Beit Sahour’s serene and increasingly avant-garde atmosphere, have instilled new life into the historic core of the town — renovating the abandoned houses and storefronts to set up communal art spaces, while modeling a radical alternative to and rejection of mainstream conventional modes of cultural production. A collective of Palestinian artists called MishwArt — a play on the Arabic word mishwar (a walk) — launched guided art tours this spring, to help promote the workshops and showrooms that have popped up in the Old City over the past few years. 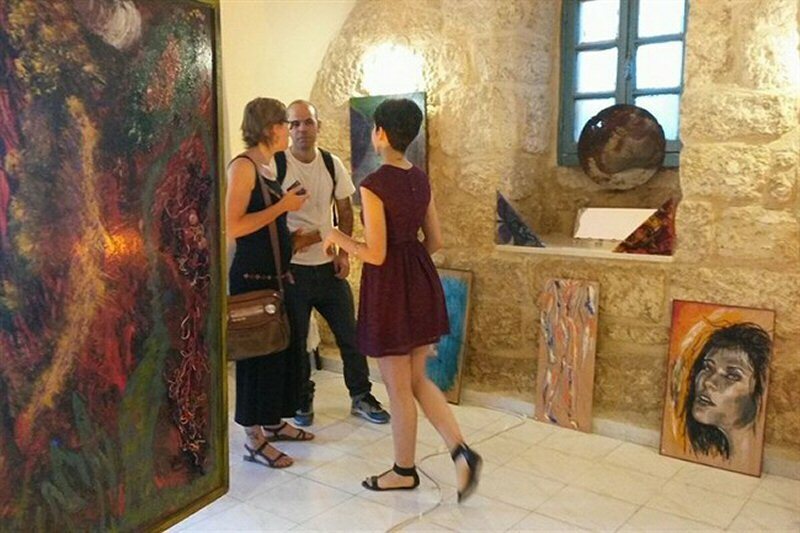 The tours have connected local artists and solidified the burgeoning community’s progressive, independent identity, which seems to be making a conscientious effort to reclaim Beit Sahour’s cultural and political heritage, and live in harmony with the Old City’s longtime residents. Kristel Elayyan, who is part of the MishwArt initiative, was involved in building one of the first businesses to renovate the area, Singer Cafe. She acknowledged that the Old City’s residents have been shy in interacting with the changing landscape of the neighborhood. “They see us walking and they are maybe a little bit interested,” she told Ma’an, as a tour group meandered through the Old City one hot afternoon in late June. “In general, it’s mostly foreigners who are interested. It would be really nice if young Palestinian artists or other locals would join. But it’s not a habit here yet, this art scene is very new for Beit Sahour. ”Coinciding with the day’s MishwArt tour was the opening of a new independent art gallery in the Old City. Its founder, Riham Isaac, transformed her grandmother’s house from a state of disrepair into Art Salon, envisaged as an open platform for art making and promoting the area’s cultural community. The cigarette-smoking, beer-drinking crowd that spills into the street from Art Salon, coupled with revelers from the ninth annual and endearingly country faqqous festival (a sort of fuzzy cucumber indigenous to the area), makes for a particularly festive afternoon in subdued Beit Sahour. On the vanguard of cooperative art spaces in the area was Resign, a now fully developed upcycling and environmental design initiative launched in 2013 by Bethlehem native Ala Hilu, with roots in the Old City workshop, but with projects enriching communities across the West Bank. In the years since he opened his workshop, Hilu has taken an active role in encouraging others to come to Beit Sahour and contribute to the art scene. However, according to him, there have always been artists in Beit Sahour — painters, filmmakers, singers — but they just haven’t always been engaged in any type of unified community. “In the years of the Second Intifada, many businesses here were forced to shut down, and people had to focus on recovering from that and bringing in income. Making this kind of art became a secondary thing,” Hilu explained. “MishwArt is reconnecting these people, which is great. This kind of art exists now in Beit Sahour, we can’t deny it. But we need more time to really discover who exactly is making art here. ”Hilu’s studio is separated into four main chambers: a training room where he holds workshops; the “heavy duty” room for bigger machinery; a storage room stacked from floor to ceilings with different types of wood, rubber tires, tubing, scrap metal, bottles, old furniture ripped apart for reuse; and finally, a proper showroom, which is still getting its finishing touches. He put out a display of some of his creations for the art walk in the training room — wrist cuffs and earrings fashioned from silver-plated cutlery, a lamp made out of barbecue skewers, another out of a gas mask filter. Like Resign and Art Salon, the most recent addition to MishwArt’s tour is also geared toward providing a collaborative space for local artists. The idea for Beit al-Musika, or Music House, was born when Tariq Abu Salameh and Nour al-Raai were studying music performance at Dar al-Kalima college in Bethlehem. The multi-instrumentalists currently perform weekly at a nearby bar called al-Jisr, where they give platform to a rotating lineup of local musicians and singers, but the two are also planning to hold afternoon “Music in the House” events at their new space in the Old City soon. Neither an institute nor a music school, Music House, supposedly open around the clock, is a place for musicians to share their creative experience and their instruments, Abu Salameh told the room full of art walk goers, before he and al-Raai gave an impromptu, slightly out-of-tune oud performance, owing to a new set of strings. Music House hopes to encourage artists to be their own producers, rather than being forced to work within the confines of conventional music labels and institutions, which often promote sexist or racist stereotypes, Abu Salameh said. According to him, there are two directions in Palestine’s music world: watered-down “fusion” musicians who follow global trends without making any compelling innovations; and on the other end, those who perform traditional Arab music who are discouraged by their peers and mentors from veering outside of established, rigid, forms. “Our experiment is to analyze the music, and discover what new forms and new structures we can introduce to the Arab world,” he said. One stop on the art walk, which may prove to be its most enduring, is the tucked-away workshop of Aref Sayed, who has humbly reached a level of regional acclaim for his masterfully restored, as well as custom made-to-order string instruments, such as the oud, qanun, buzuki, and violin.Originally from Jerusalem’s Old City, Sayed returned to Palestine after studying his craft in Germany, Turkey, and Italy, and opened his workshop in Beit Sahour in 2015. When asked why he chose Beit Sahour to establish his livelihood, Sayed dismissed the possibility of launching such an enterprise in his hometown of occupied East Jerusalem just a few kilometers away, where Palestinian business owners face crippling bureaucratic obstacles and discriminatory policies at the hands of the Israeli-controlled municipality. “In Jerusalem, everything is different — politically, economically — while here, people are more open,” he said. However, operating a niche, artisanal business in the occupied West Bank is not without its challenges. Nothing Sayed needs is sourced locally, except for the tiny pieces of metal he points out on a qanun’s soundboard that he custom makes on a special machine, which set him back some 25,000 shekels ($7,010). “It’s very, very hard,” he said at length, after an art walk participant asked about his sourcing process. “It’s hard to find tools, to find the wood, to find anything here. After two years of work, I’m already exhausted. It takes a lot of money, energy, and time. It’s not easy to be an instrument maker in Palestine. ”But over the course of the past several months since setting up shop, he’s noticed positive changes in the neighborhood, which has been a source of inspiration and encouragement for Sayed.